After Prestige Deck Coating installs your flashing and metal lathe level, we are ready to move on to the next crucial step in deck waterproofing foundations. To complement the strength of the metal lathe and to provide unbreakable flexibility, we utilize the most advanced cementitious technology. Our cement base coat is a polymer modified concrete solution to add flexibility to the traditional cement coating. Concrete Base-Layer 1. We begin with a hearty base coat of iron-like cement mixture, which slow dries to eliminate unwanted cracks. This layer is for strength and bonding to the plywood/lathe foundation. The strength of the bond is enhanced by the cohesion to the metal lathe level, which is in turn securely stapled to the stud anchored, plywood floorboard. 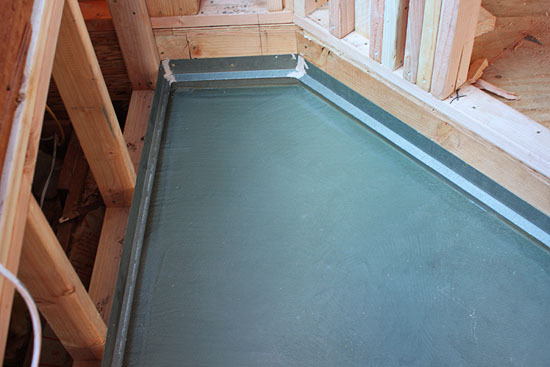 This is a key step in the deck waterproofing process, as it is the buffer layer between the subfloor and the fiberglass layer. The solidity of the floorboard is harmoniously accentuated by the torque of the polymer modified concrete layer. The strength of the concrete base coat is foundational for the waterproofing properties of the fiberglass and bonder coat. Only after insuring that the cement sets and is marble smooth, we move to the fiberglass layer. We do not rush through any of these crucial steps. Your waterproofing success depends on this patient and skillful process. 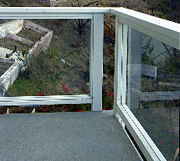 Strength and flexibility is what you can expect from Prestige Deck Coating and Waterproofing company Orange County CA. 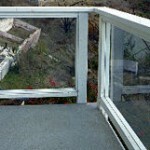 Our deck repair specialists have anywhere from 10 to 30 years experience in waterproofing decks. We are trustworthy and seek to meet the specific needs of every customer. 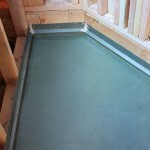 With two layers of polymer modified concrete on your deck waterproofing project, you can welcome the rain!